What is Pro-Banthine used for? Pro-Banthine tablets contain the active ingredient propantheline, a substance that causes smooth muscle in the gut and bladder to relax and decreases secretions such as sweat. Pro-Banthine is used to treat many different disorders, including excessive sweating, gut disorders and involuntary urination. Pro-Banthine is a prescription-only medicine. Pro-Banthine works by relaxing the smooth muscle in places such as the gut and bladder. It is used to treat gut disorders involving muscle spasm, for example irritable bowel syndrome, and involuntary urination (incontinence) in adults. The active ingredient propantheline also dries secretions such as sweat. Pro-Banthine is therefore also commonly used to treat hyperhidrosis, a medical condition in which a person sweats excessively and unpredictably. Hyperhidrosis often involves the palms, underarms and feet. There may also be excessive sweating on the neck and face after eating or exercising. Pro-Banthine should be taken on an empty stomach, at least one hour before meals or two hours after. This is because food will reduce its effectiveness. The tablets should be swallowed whole, without chewing, with a half glass of water. If you have forgotten to take a dose, take it as soon as you remember, unless it is almost time for your next scheduled dose. Do not take a double dose to make up for a missed dose. one tablet three times a day before meals and two tablets at bedtime. The number of tablets to take, how often and for how long will depend on the condition being treated. It is important to follow the instructions given by your doctor. Pro-Banthine is not suitable for use in children. Read the package leaflet before use. Consult a doctor if these or other side effects are severe or persistent. For a complete list of possible side effects, see the package leaflet. You have a heart disease. Consult a doctor on the use of Pro-Banthine if you have a health condition that is not listed above or are currently on medication. 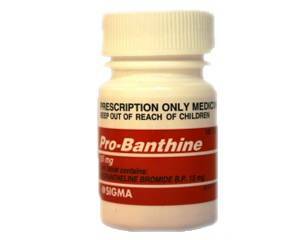 Do not use Pro-Banthine if you are pregnant or breastfeeding, unless otherwise advised by your doctor. This medicine may cause your vision to blur and impair your ability to react. If affected do not drive or operate machinery. Do not drink alcohol while taking this medicine as this is likely to trigger or worsen the side effects.